Richard M. Lester, founder of Aid to Injured Motorcyclists and the National Coalition of Motorcyclists as well as numerous biker outreach groups, was nominated by his peers for induction into the Motorcycle Hall of Fame in Sturgis, South Dakota. 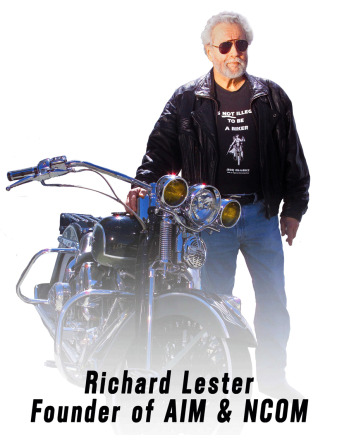 For more than two decades, Richard M. Lester has dedicated his professional life to bringing together one of the most diverse and divisive communities in this country and the world, in order to solve mutual problems, stand together against government interference, and protect motorcycling as a sport and lifestyle. After graduating from law school, Richard took the advice of a college professor to seek out a group of people who were systematically discriminated against and who were unaware of their rights or legal recourse. Richard cut out a perfectly good Porsche in half to create his distinctive trike to ride to motorcycle events and meetings, set up booths and give “Know Your Rights” talks, and became a champion of bikers’ rights. In the early years the effort was to form a base, and join together attorneys throughout the USA and Canada that represent motorcycle accident victims, and that were not only the best litigators but also cared deeply for their clients and for motorcycling. This Aid to Injured Motorcyclists (AIM) network of attorneys not only ride, but are willing to put part of their legal fees back into making motorcycling better and safer. After forming the financial support for this effort, in 1986 Richard called together various movers and shakers of the state motorcycle rights community across the nations in an effort to fund a coming together of these many groups. Over the past 30 plus years, the National Coalition of Motorcyclists (NCOM) has grown from a dozen or so, to well over two thousand. The original state motorcycle rights organizations (SMRO’s) expanded their sphere of influence by welcoming safety groups, touring associations, trikers, clubs, PACs, Christian organizations and through the AIM independent shop program consisting of over 8,000 motorcycle shop owners. NCOM through its Board of Directors and Legislative Task Force does not tell any group what to do, but rather is there to advise, provide help and become a political force working towards “freedom of the road”. The success of this legislative unity was soon noted by the motorcycle clubs. These fellow riders were/are being discriminated against by private establishments open to the public, harassed to the extreme by our government and subject to law enforcement profiling and preconceptions. Bringing these patch holders into the coalition was totally another matter, but with much trepidation a meeting was called in Southern California to put aside past differences to work together, and in 1988 another political force was formed – the Confederation of Clubs. There have been a few bumps in the road but there are now, through the forward thinking and good works of the regional and national leaders of these clubs, 52 Confederations in 33 states and provinces all autonomous but working together in unity. The National Coalition of Motorcyclists continued to grow and its annual national convention attendance was also growing with all the elements of the national and international motorcycling community joining together to fight for our rights. Various segments of the motorcycle community have since been brought under the NCOM umbrella to provide a voice for those riders and Christian Unity, and meetings are held (with workshops) at each NCOM Convention. Richard, upon hearing of the lack of harmony and unity in the Christian motorcycle community, together with the NCOM Board of Directors, developed Christian Unity as a movement within the Christian riders of this great nation. The National Sport Bike Association is now up and running to help our brothers and sisters who are being profiled and discriminated against in the sport bike community. Currently the executive director of the NSBA is organizing regions and chapters throughout the United States. Through AIM, NCOM and the COC, Richard has provided a venue for unified activism and a voice for America’s motorcyclists to influence politics and policies that affect us on the local, national and international fronts.